Staying at Lenna of Hobart a beautiful heritage hotel in Battery Point puts you on the doorstep of Hobart’s best. Step outside and explore on foot – the best way to discover our inviting bars, restaurants, historic neighbourhoods and more. In the 1860s, Lenna sat alone on the hill, grass tumbling down to the River Derwent’s edge. Today, the sandstone mansion sits beside plenty more company and is one of the leading hotels in Hobart. A few steps, and the Salamanca strip presents cafes, artist studios, classic pubs, galleries and of course Australia’s largest outdoor market each Saturday. Salamanca Market brings colour, flavours and makers between 8.30am and 3pm every week. Wander along Salamanca Place and take a quick left up Kelly’s Steps. This historic staircase takes you into Battery Point. Back in 1818, there was a battery of guns on the point (now Princes Park, complete with underground tunnels)point, for which the area is named. amanca Market (8.30am-3pm) brings colour, flavours and makers between 8.30am and 3pm , for which the area is named. Regarded as arguably Hobart’s most prestigious suburb, wander past Battery Point houses dating back to early European settlement. Notable stops include St George’s Anglican Church in Cromwell Street and Arthur Circus, the country’s only ‘circus.’ The old cottages once housed officers of the garrison and in early days children would play marbles in the grassy circle. Further along in Hampden Road, the Queen Alexander Hospital is where Hollywood actor Errol Flynn was born back in 1909. The street is also home to famed Jackman & McRoss Bakery. Over the road On Hampden is packed with wares by local makers and a talented florist resides out the back. Drop into dinner at A Tiny Place (Francis Street) and be treated to authentic French cuisine by Chef Philippe Leban. 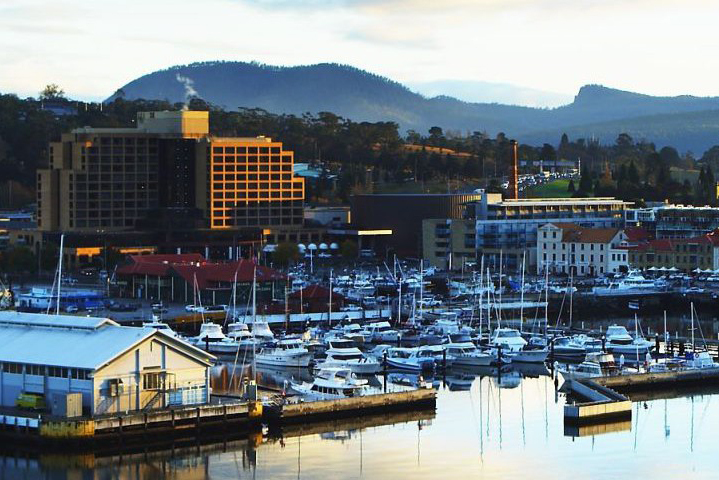 Hobart’s waterfront is a constant hive of activity. Drop into Lark Cellar Door & Whisky Bar for a nip of fine Tassie single malt. From Lenna, it’ll take around ten minutes to walk there. Also nearby is the Brooke Street Pier. The pier is packed with mini-stores offering anything from fragrant local soaps to vodka made from sheep’s whey. It’s also the departure point for the Mona ferry. Treat yourself to a cocktail or pre-dinner bite at the Glass House before heading upstairs to dine waterside at Aloft Restaurant. Then a short stroll back to your Salamanca accommodation.